Last week, I explained why roosters crow, and provided some backstory as to my experience with chickens. Today, I offer no backstory, but more chicken-related information! When you think of chickens, the word “fly” likely never pops up, unless it’s preceded with “can’t”. Although they are capable of brief bursts of flight, you’ve probably never seen one soaring through the sky. What a sight that would be, huh? But, as with all things, humanity seeks to find the limits of all things, living or nonliving. We collect these records and compile them into books of feats both wondrous, and dangerous. The chicken is no exception. 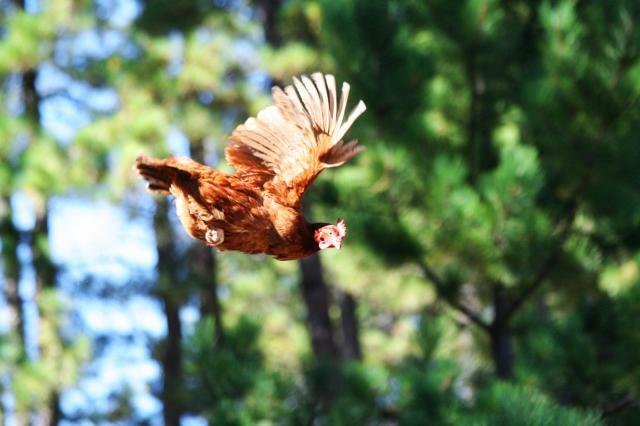 Believe it or not there exists a record for the longest flight of a chicken. But, first, some history about your favourite fowl. The Gallus gallus, or chicken, of today’s backyards, were once undomesticated. Odd as it might be to think of chickens clucking through the wild, they actually descend from red, and grey jungle fowl. Evidence suggests a closer tie to the grey, however, as they and the domestic chicken share a yellow skin colouring. Although similar, domestic chickens measure at twice the size of Indian jungle fowl.